Old missions will need the ELPS(on) advanced command set, otherwise they don’t appear. If in a mission a couple of tankers have TACAN set up then that seems to break the Datalink. The IFF needs to be turned on with Hornet cold start, otherwise you won’t get Mode 4 IFF (sensor switch depress with Radar TDC over target) unknown/friendly/hostile categorization. The E2 AWACs seems to work, but editing it to an E3 seems not always to work. Not sure why. The AWACS doesn’t give aircraft type id, i.e. M29 etc. I’ve found boxing the NCTR and doing it myself does work, but obviously very dependent on range and aspect angle. Are people having success with this? I can’t work out the Bulls Eye (BE) and BRA angles, or rather mine don’t seem logical yet. Probably just me. Anyone got any experience with these new bits to share? I think @Wes had some success in figuring a lot of it out. EPLRS(on) or switch AWACS unit to a different type, then back to a E-3 or E-2. Haven’t noticed any difference between E-3 or E-2. All my client based Bugs have EPLRS set to on by default with no changing needed. So even if you don’t have an AWACS present, you can still link with other Bugs. TACAN beacons don’t break my datalink, but TACAN will always be set to on when the datalink is on. Always in the X and you can only change the beacon number. Aircraft ID/NCTR is very unreliable, but IFF seems to work pretty well. When you lock a single target, it will by default go to a diamond. With IFF on, press the interrogate (sensor switch depress) button with the radar page selected and it will determine friend/foe. This also works on the SA page for unknown contacts. Cold starts require you to fire up both the IFF and the datalink by using the IFF and D/L UFC buttons. Tripped me up at first, so mentioning it here. As mentioned, doing so also turns on the TACAN and forces it to the X mode. So if you use TACAN for navigation, you’ll have to turn off the datalink to be able to go to the Y and A/A modes. AWACS can also detect and report certain missiles on the SA page. Watched Wes launch HARMs and could see them show as unidentified contacts on the page. Sorry guys - I’m snowboarding now, so I haven’t been checking. I figure I should try to clarify things, and if anyone knows otherwise - let us know! I think the biggest confusion from Wag’s video was the distinction between IFF mode 4 and NCTR. It key to remember, these are separate functions. I had to watch the video a few times myself, because he talks about both pretty much at the same time. IFF is done via mode 4 IFF system, which does make use of the radar & IFF radio. IFF will tell you friend or foe, but doesn’t tell you WHAT you are looking at. For anyone familiar with civilian ATC, think of the transponder codes (“squawk”) - that is actually IFF mode 3. Now it’s too low tech (lacking encryption and complexity) for military use, hence mode 4. Let’s assume today’s IFF code is 1234. It would be like pinging the transponder, and it send back it’s code. If you get 1234, it’s friendly. Otherwise, hostile. That code doesn’t tell you what type of plane it is. Put your radar cursor over a target. Results will appear on HUD and SA page. Same as above, might as well have IFF on (lest you wish to be seen as hostile to everyone) and Datalink. Turn on NCTR via the bottom right of the Radar display. Since NCTR utilizes the radar, it must be on. I assume you can increase the chance of an ID by narrowing the scan elevation and azimuth of your radar so it gets more pulses on target & returned. Select the SA page as active DDI or MPCD. Hover your SA page cursor over a target. 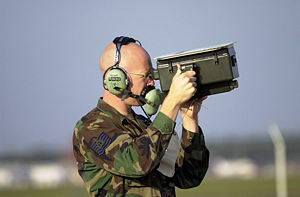 NCTR requires a head-on aspect to get radar signals into the targets intakes. Azimuth and altitude deviation will degrade chances of this working. Results, if available will appear in the bottom right corner of the SA page. Shortened callsign. For allied flights, this is the first and last letter of the callsign and it’s numbers. For example: Ford1-1 = FD11, Chevy2-3 = CY23 and so on. After the callsign is a slash ( / ) followed by the aircraft’s fuel level, in pounds. “30” = 3000 as an example. Below this is BRA (bearing, range, altitude) but it only seems to have the B & R. The numbers on this seem off right now, I am not sure if it’s BRA from one’s aircraft, or your Air-To-Air waypoint. To note, I found NCTR only reliably held the ID just before hitting visual range - outside of that, it would grab and lose the identity very quickly. I may need to test more though. My initial tests still used a wide scan on the radar, so as mentioned a narrow scan zone would probably give better results. I do not believe AWACS can perform NCTR - but if they can, they are likely too far for it to work anyway. Their radars are also not as focused, spinning 360° so the odds of it working I think would be slim. Updated my above post with some Wikipedia links - for those so inclined, it’s interesting to see how IFF progressed in World War II. That first article gives an example. Both are relatively short. I also tidied up a couple typos and made things a bit clearer. Maybe we’ll have IFF on our WWII planes? SoonTM? The AWACS doesn’t give aircraft type id, i.e. M29 etc. AWACS doesn’t have NCTR. That said, when working fleet air defense, the carrier can edit Link16 tracks to include type…done via a small intel watch. I asked about this earlier before SA came on line. I know the E-2 should be able to see the updated track info but not sure what the fighters are getting into their SA picture. And quite frankly, we didn’t bother with that so much. What we added to the picture was primarily for use of the Strike Group commander and his warfare commanders/coordinators. At the end of the day if AW (BW in our strike group) tells a section of Hornets to engage a target, that is what they do, pretty much regardless of what they do or don’t have on their SA. Quick clarification for future proofing since ED seems to want to update all of this IFF stuff, mode 4 can only ever give you positive friendly indications. Once they have the roe matrix, a negative mode 4 return can only ever mean the contact is neutral, not hostile. 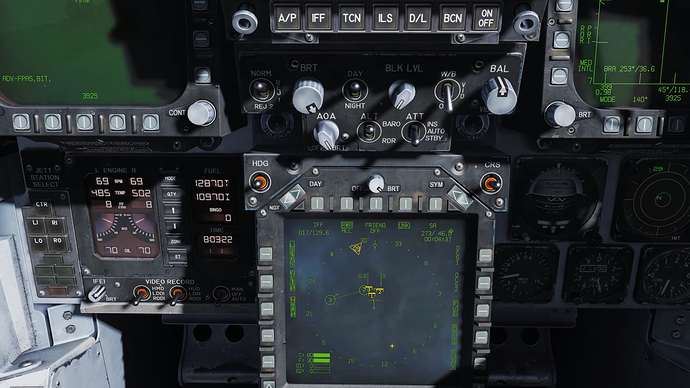 It’s simplified to friend/hostile right now in DCS because they haven’t implemented that functionality yet. The NCTR print will only show you the type, getting fuel and callsign number and all that is based on the contact being a friendly link participant, not NCTR. But it shows in the same place. If you are wondering why the data drops and you have to re IFF or NCTR contacts, it’s probly because you don’t have an AWACS pumping surveillance tracks. If your radar is the only radar out there, any time the contact disappears from your scope, that track and all associated data (IFF/NCTR) is dropped, this includes dropping the contact due to your radars refresh rate, so if you change the frame store value (air to air radar-data-pushbutton 10, which is in the upper right corner) to read 8 or 16 (remember it has a different default setting for each air to air weapon) then it will hold the contact for that many frames without getting another radar hit, which gives the radar time to hit it again and refresh the track. Things to help this is also, having a wingman there so hopefully one of you is supporting the track at all times. Best solution is an awacs pumping out surveillance tracks, now any updates you make to the track (IFF/NCTR) will remains correlated because your system never loses the track because the surveillance track fills the gaps your own radar has. EDIT: Also the BRA on the SA page is currently borked, it is in relative bearing to your aircraft with your nose being north. So if it shows 270/40 that means he is 40 miles away off your left wing This is incorrect (unless this version of the hornet is rather silly). Bullseye data appears to be working just fine. Thank you! I thought I was going crazy trying to work out how that worked. Once they have the roe matrix, a negative mode 4 return can only ever mean the contact is neutral, not hostile. Technically a negative Mode 4 return is an either neutral or hostile aircraft. However, when you apply the ROE in place for the specific operation / conflict, a negative Mode 4 by itself can mean hostile. ROE should take into account that a defined geographic area to include the waters and airspace, are a war zone, any non-belligerent vessel or aircraft should avoid. Likewise, if the non-Mode 4 radar contact is fling in a tactical or aggressive manner–i.e. 500 knots GS, and keep making hard turns for your flight–then ROE may allow you to determine it as hostile…airliners just don’t do that. An important caveat to US ROE is that no ROE restrictions prevents you from acting in your own self defense or collective self defense. Good ROE will provide clear definitions of Hostile Actions and Hostile Intent. Normally if you see either, fights on. Regarding DCS MP servers that are focused on A2A. I would think that the ROE is pretty open and that a negative Mode 4 = enemy.